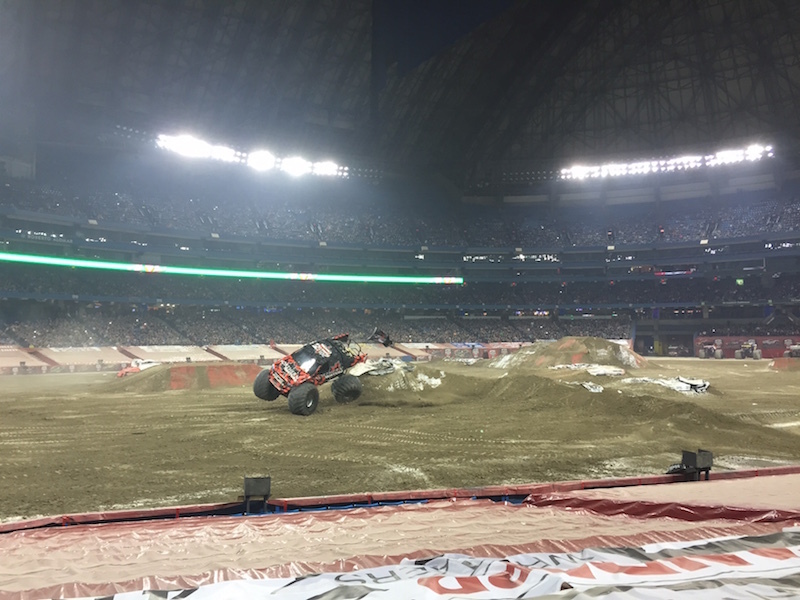 Maple Leaf Monster Jam rolled loudly into Toronto last night, more of a roar really, and won the hearts of thousands. I was converted from a “no way are we going to that” to a “this is a new tradition” mom in less than 2 hours. There is another show today and here is why you should check out Maple Leaf Monster Jam in Toronto or as it drives, smashes, flips and jumps through Canada. I didn’t expect Monster Jam to be a tournament. I sort of expected it to just be a series of crashes. What it actually is instead is a live race with different trucks going head to head. There is also a second series that is a freestyle competition. 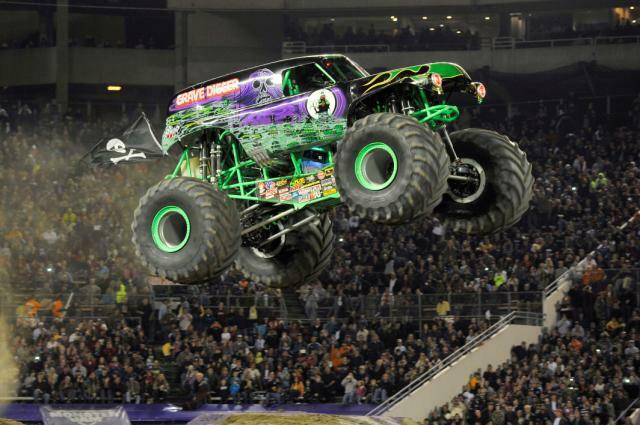 The Monster Trucks don’t crash into each other but instead jump over and smash vehicles as large as commercial vans. They spin, do wheelies and every once in a while actually flip right over! There is an element to how daring this activity actually is that kids and adults equally find mesmerizing and enticing. 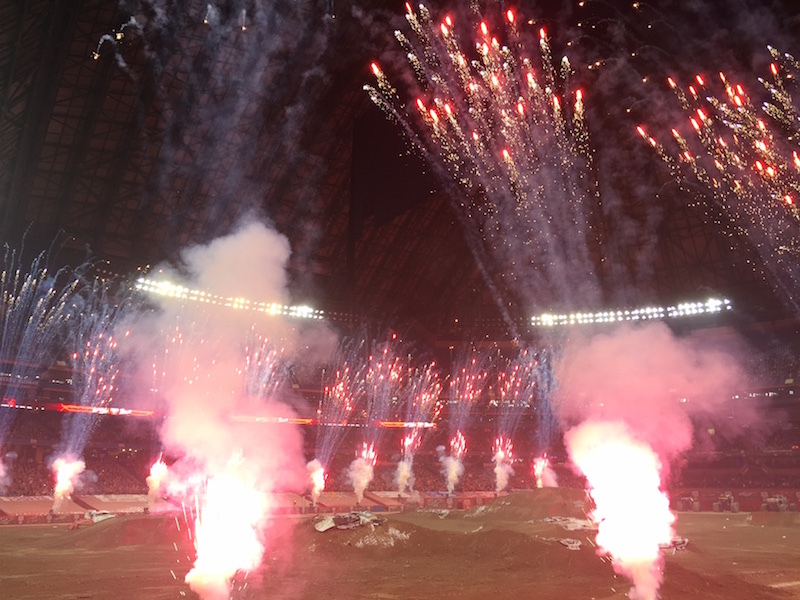 Last night, a hush fell over the crowd as a moto cross driver fell during a stunt landing quite badly and needing medical assistance. There was a realization by myself at least that these guys and girls are in fact risking a lot for this form of entertainment and its a real sport. Also, Will, my 6 year old declared that he would never drive a motorcycle. 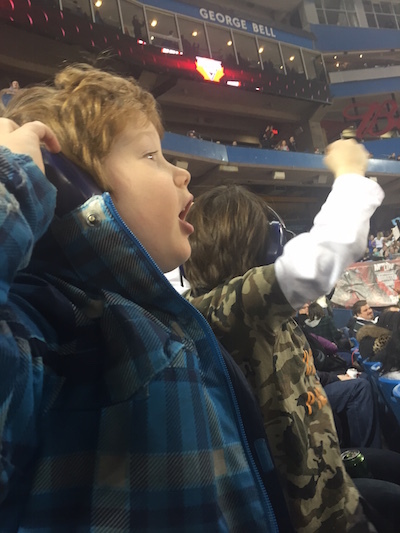 So thanks you Maple Leaf Monster Jam. I owe you big time. 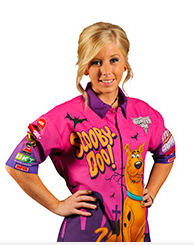 Speaking of girls, a number of the monster truck drivers are women! I didn’t even think to invite Charlie to the event and now know that next year she will need to come. It was so cool to see these women climb into these massive trucks and compete with the big boys. It made me realize that there could be a real draw here for little girls and as I looked around I realized how many were in the stands. I like to teach Charlie she can be anything and now my usual repretoire of astronaut, doctor, candlestick maker will have an add in of monster truck driver. Not a little bit loud. We naively purchased ear plugs at a pharmacy for this event. You are going to need industrial ear muffs for your kids unless you want them to have a legit reason to ignore you for the next 3 weeks. The good news is they sell them on-site and for a reasonable price. We purchased the $25 ones and they worked like a charm. I estimate we were about 25 feet from these trucks so MISSION ACCOMPLISHED industrial ear muffs. The same ear muffs online run about $20 so a reasonable price when I’m sure unprepared parents like myself would have paid twice that. Like dirt and mud dirty. Not the other kind. As I said we were close to the pit and down quite low in the seats. The first 15-20 rows are actually covered so in our section Row 16 was actually Row 1. When we arrived, I naïvely brushed the dust off my seat and Will’s while the couple behind me laughed. Minutes later I understood why. A film of dirt sort of settles in the air and on everything. Not a time for a white blouse ladies. The event is very well timed. There is a decent intermission that will allow you time to hit the facilities and shop a little. It isn’t too long and certainly not too short. A great night out for kids. Although it was quite busy tickets are still available here. I highly recommend buying tickets to the Pit Party where you can mix and mingle with the drivers and check out the trucks. Throughout the night, prizes were given out to people in a draw who had attended the Pit Party. 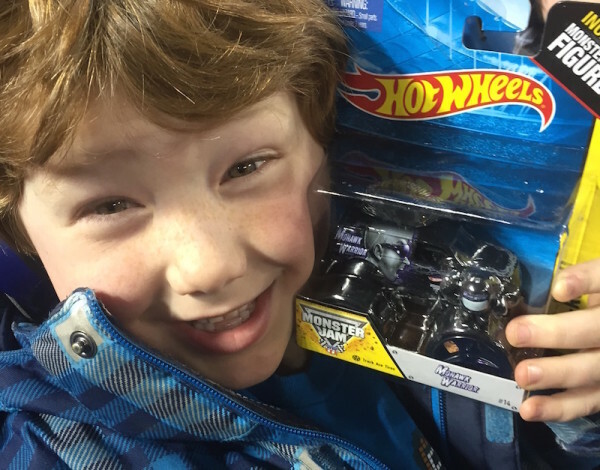 Among the souvenirs you can purchase, there are reasonably priced Hot Wheel trucks that are tiny versions of the trucks in the Monster Jam. Will’s broke almost immediately and when I went to return it the guy said to me quite directly “I sell them in the package. This isn’t my problem”. Of course, Will at 6 shed a few tears. On the way out, I visited a different booth and the man there immediately replaced it. We had purchased the Mohawk Warrior Truck. If you are buying one and this happens go to the larger booth at the front entrance as they seemed more adept to dealing with issues like these. All in all, this event is awesome. Let me tell you, I am singing a different tune that I was when we first found out about it. I do plan on returning and especially bringing my feisty daughter into the pits to meet the female drivers. The drivers of all the trucks seemed incredibly fun and kind. If you prepare a sign for them and they win, they scan the crowd to give you the trophy they have won. It would be a pretty cool accessory in any home particularly as a night light in a kid’s room. We loved the show aspect of Monster Jam and the friendly competition. By the time some trucks were shooting out fireworks we were flabbergasted. Kids 2-99 were seen enjoying themselves and the atmosphere was electric. A do not miss as Maple Leaf Monster Jam rolls across Canada.